Our talking is a kudzu of carotids in which we lose our marbles. Hours later, they tumble out as we are snoring, awakening us one at a time, hard little tumors we flick underneath one another. By morning, we lie like border states whose boundaries are rivers, anomalously straight, canals funded by nature. Horvath is a master of the small who exercises a very precise and peculiar brand of metaphysics. Each of these stories has unique moral and ethical dimensions that are penned in by the fantastic and the absurd. If you look closely, the larger narratives readers are used to—dramatic juxtaposition, struggle for meaning, moral dilemma, justice, life and death—get their fair treatment, but they are compromised by an elusive force. Each story contains within its dominant logic an under-nature running concurrently against it. It is a dialectic that at its very most implicates the mutual manifestations of subject and object which create a world just ahead of us able to be perceived and at its very least does well to reinvigorate some of the stale and deadened devices of storytelling. These fictions work on a double nature of the image . . . things not being what they seem. Worlds arise out of backwards laws and logics and then disappear as fast as they assembled, leaving protagonists and readers together to figure out whether the rationalizations that were just required to figure out the story were ever real in the first place. Sasha starts laughing, and other are beginning to take notice. “Wait here,” says Pete to Sasha and Hanh. “I’ll be right back. Wait together?” They nod solemnly. Jesus, thinks Pete, in a headlong race toward the castle now, the crowd parting for him. Everything has begun to happen in slow motion. These stories work so well in the realm of the small because it is there where details are up for dispute. Whether it’s the unrealiability of memory or the realm of quantum uncertainty, the phenomenology of our world is founded on the pliability of perception. Understories flips you from the micro to the macro, successfully pulling the elephant through the keyhole at more than one plot turn. In the title story, Understory, you are led to reconsider what you know about Heidegger and the fate of a Jewish professor as the Nazi movement eclipses pre-war Germany. The dendrology professor, who is simply and blissfully consumed by the world of trees and plants, establishes an altruistic friendship with Heidegger that is by all intents personal and non-political. The gravitas of history is held over us as we anticipate the Nazi cloud smothering most of Europe. What is unique is that by the narrative becoming minor and escaping the moral weight of structural history the very inertia of the story is driven by our doing, in this case by the inner movement of our own conscience in knowing what happened historically and the curiosity of not knowing what happens in the fiction. The same is true of a very quick but unique treatment of the painter Paul Gaugin’s well-known sojourns through Polynesia. The story reimagines the Frenchman’s course, landing him not in Tahiti but in Greenland. Whether the author starts at the outset by having you agree that perhaps Heidegger wasn’t a Nazi monster, and enjoyed discussing tree hybridology with a passionate and quiet Jew, and that Gaugin didn’t go to Tahiti but rather Greenland for inspiration, these narratives get underneath the fundamental understanding of a world that is ethereal and magical, subject to influence and change. This is transformative prose at its best. It is not even secretive of its motive to transform the reader. It is intimate through questioning the worlds constructed in each story, and asks you to accept each construction by whatever device demands that acceptance, whether it’s empathy, zaniness, lust, or the blurry morality of historical hindsight. The author has you agree that the small details of the world are often missed or misinterpreted and then zooms out the lens and reveals the larger context of each character’s struggle. Then you are forced by a razor sharp inductive logic that the world we live in, and even worlds beyond the one we are in, are manipulable, made up, subject to change, and at their truest essence, able to be written and re-written. In another word, fiction. Which is the guiding mark for any meaningful experience of art. To change the reader, and admit that the world is changed through that process. For a major debut, fiction of this sort will benefit any reader willing to spend real time with it. 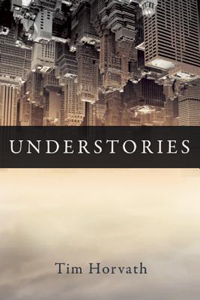 If you want an actual contemporary wordsmith who does not just tinker but thrives in the micro-worlds of Calvino and Borges, Walser and Perec, read Understories and have a lot of fun with a world you know very little about. Jarret Middleton is the author of An Dantomine Eerly and other fiction. As the editor-in-chief and co-founder of Dark Coast Press, he has been profiled in Shelf Awareness and The Stranger as an exciting new independent publisher. His fiction, essays, and reviews have appeared in The Collagist, Smalldoggies, Big Other, The Nervous Breakdown, Smoke Long Quarterly, Strike, Slingshot, and Hotel Angeline: A Novel in 36 Voices. He lives in Seattle, WA. For more information visit www.jarretmiddleton.com.